Click the button with the plus sign in the main navigation bar and select “New Meeting”. This will create a new meeting document and all you have to do is complete the fields in the template and your agenda is ready. You can collaborate with the other meeting participants on the agenda, you can add notes, assign tasks and share files. In addition to the orange button, there are a few more ways of creating a new meeting. 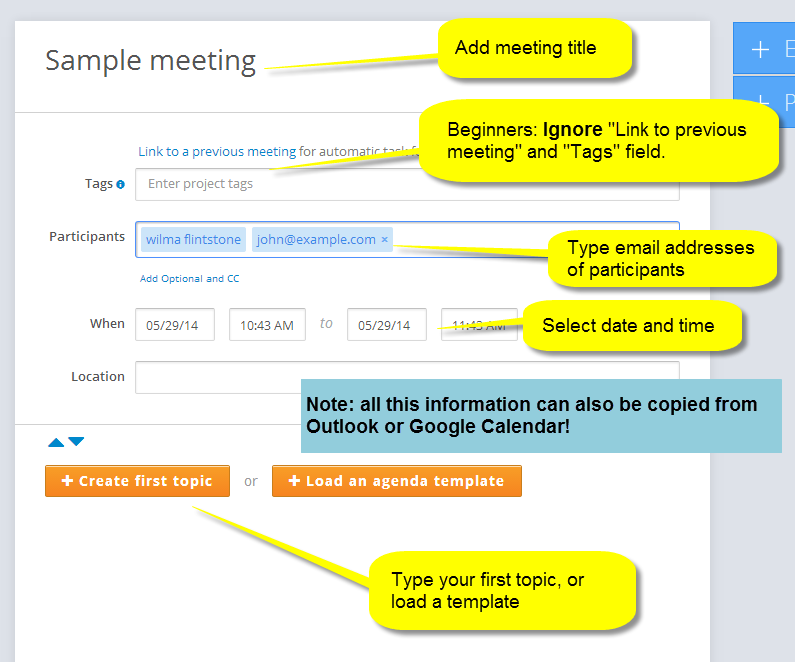 You can also create a meeting directly from Outlook or Google calendar. This way you do not have to enter the title, participants, date, time and location. *Meeting invitees do not need to have a MeetingKing account for MeetingKing to be effective. You can use it simply as an easy way to create and distribute your agenda, to take notes and email the minutes and manage all your tasks.